HAWKs Host First invitational Gaming Day | H.A.W.K.S. Chris Palmer This past Saturday the HAWKs hosted their first ever Invitational Gaming Day. 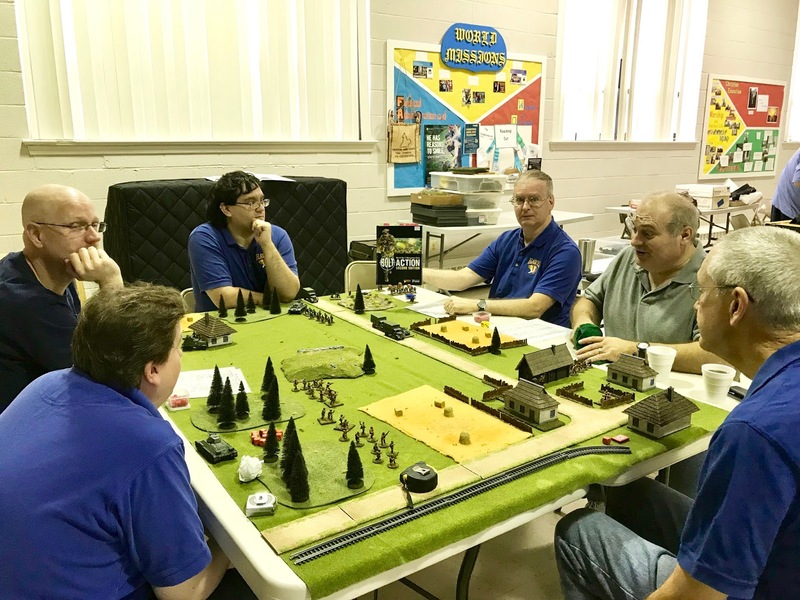 This came about after some regular attendees of the HAWKs BARRAGE convention, from New Jersey, asked the club if it would be possible to get together on a more informal basis this October for a friendly day of gaming, after this year’s BARRAGE had to be rescheduled to January ‘18 due to a mess-up with the venue’s scheduler. We ended up with a nice crowd of over 30 gamers from the HAWKs, New Jersey, and some from Western, MD and Pennsylvania. 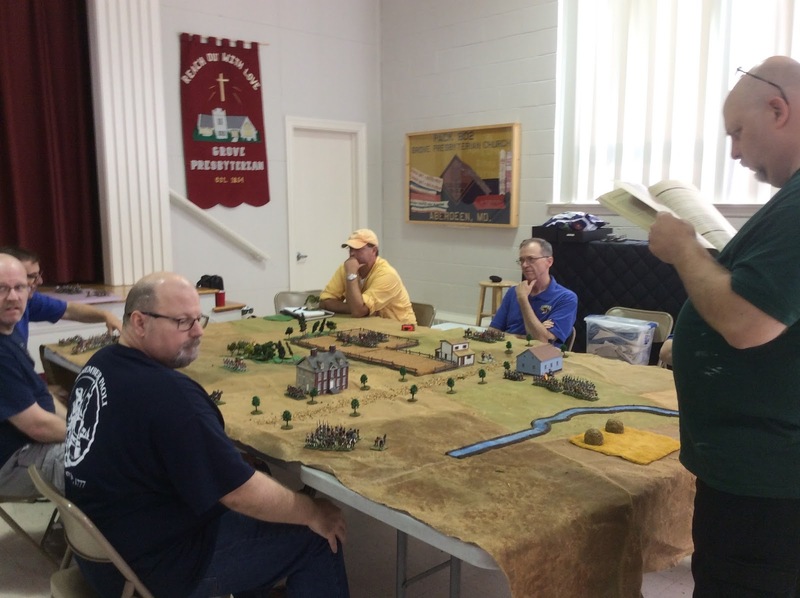 We used the meeting hall in the church where we run our regular meetings, and set up six full sized 8’ x10’ tables, and scheduled for two blocks of games; the first from 9:00AM- 1:00PM, and the second from 2:00PM to 6:00PM. The games offered spanned many historical periods, as well as both the Fantasy and Sci-Fi genres. It was big success, with everyone having a great time, and there’s already talk of doing it again! 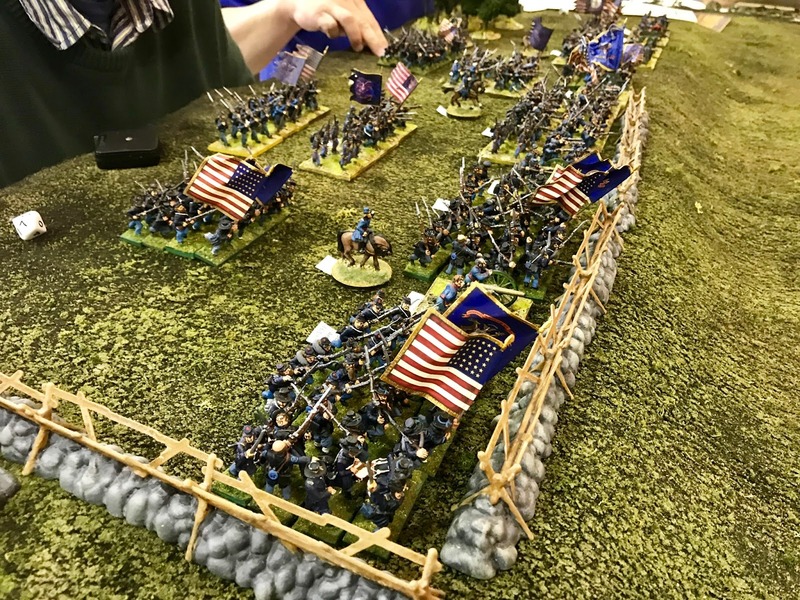 Don Manser’s beautiful Pickett’s Charge game using Fire & Fury. 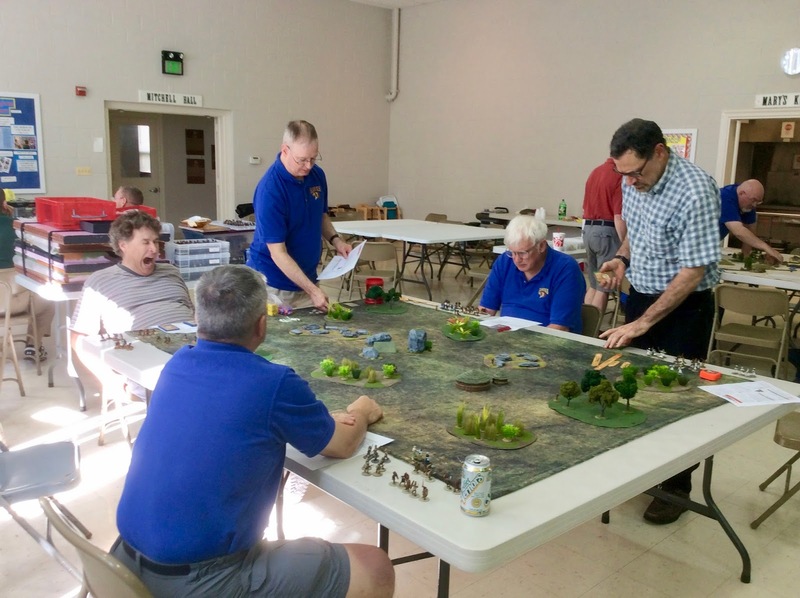 John Mitchell’s Operation Barbarossa game using Bolt Action. Sam Fuson’s Sherlock Holmes puzzle solving game using G.A.S.L.I.G.H.T. Heated pile on pile action in Jamie Davis’ Magic Carpet Racing game using a Future Race and Blood & Swash hybrid. Don Hogge’s Rumble in the Jungle game using Congo. 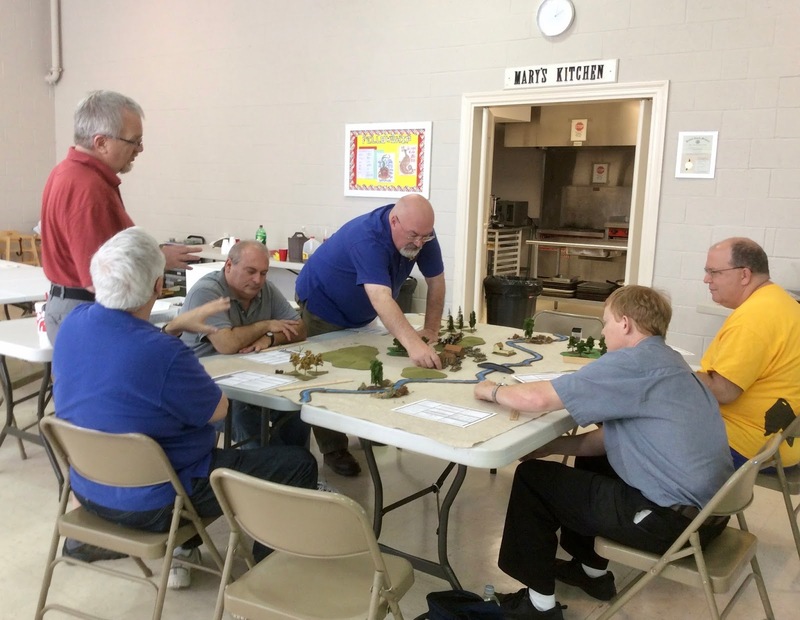 Greg Priebe’s Clone Wars game using the new Star Wars supplement for Combat Patrol. 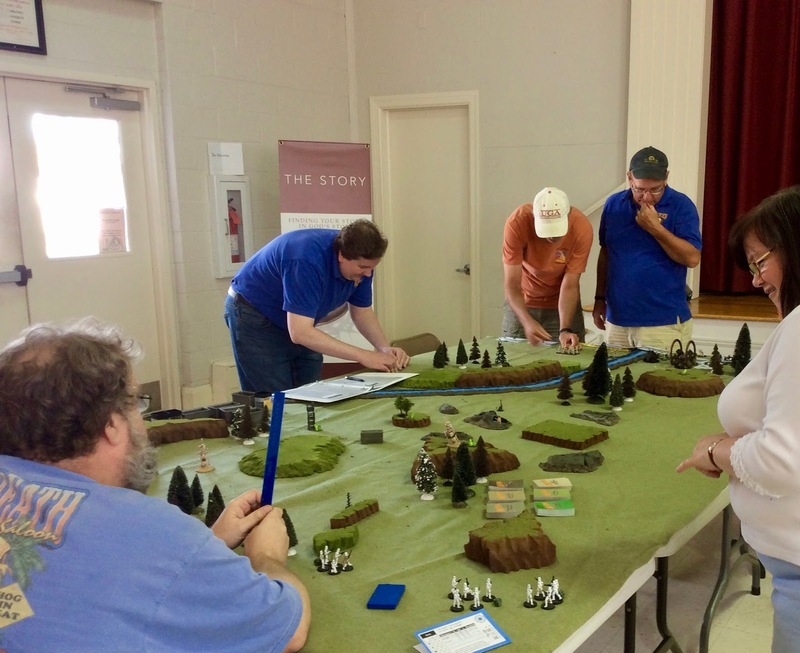 Cliff Brunken’s Battle of Germantown 1777 game using Black Powder. 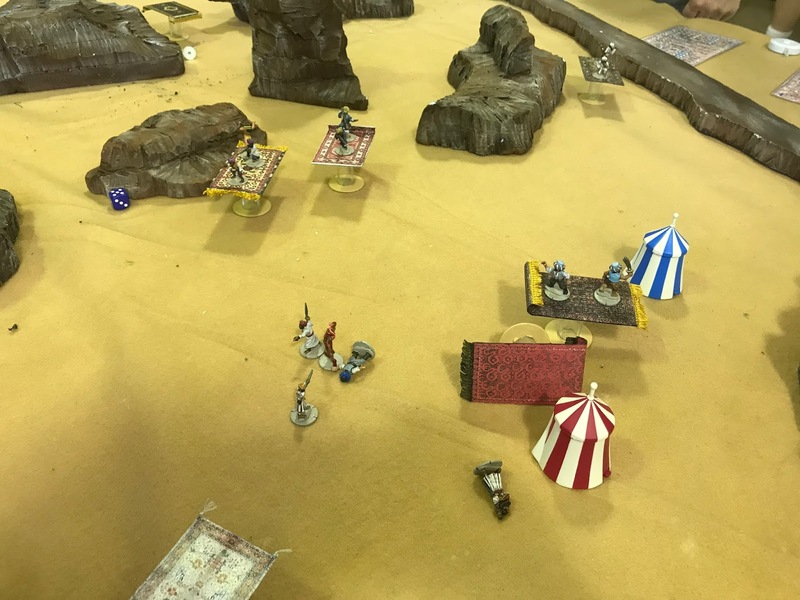 John Hollier’s 15mm Napoleonic game using Shako 2. 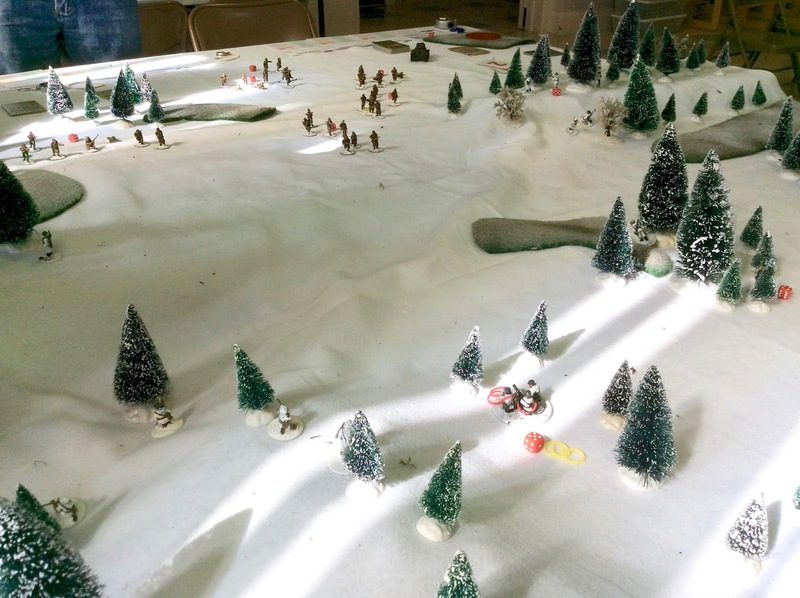 Zeb Cook’s 1939 Winter War game using Combat Patrol. Thanks to the GM’s and gamers for making this such a success. From the onset we decided we wanted to keep it simple, so there was no food service (we ordered some 3’ subs from a nearby Subway for lunch), and no flea market. It really was a great low key and informal chance for gamers to get together for an excellent day of gaming. 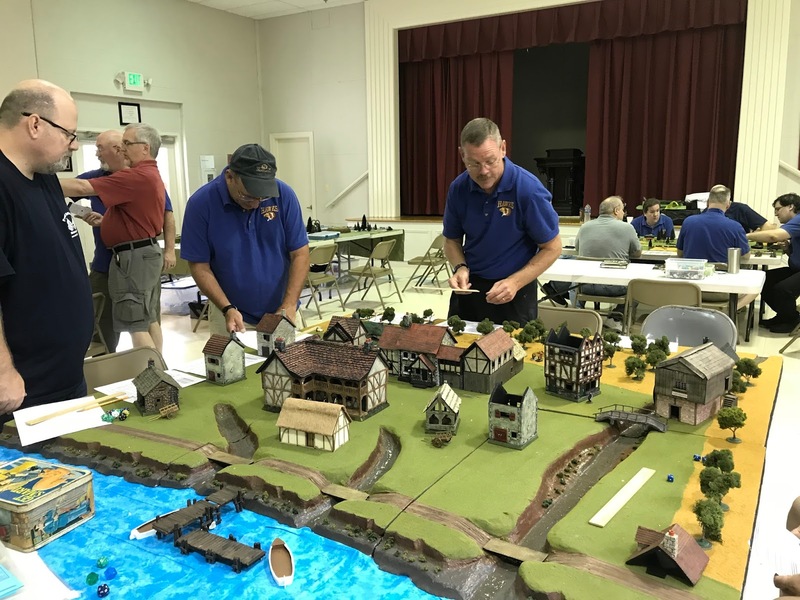 After Barrage 2017 was postponed to January, Cliff Brunken of the DelVal Gamers suggested that we try to do something with the HAWKs in October because he didn’t want to miss out on his annual visit to the Prost German restaurant. He and Buck came up with the “Invitational Gaming Day”. After gaming we did adjourn to said restaurant where much fine food and ale was consumed, and further fun ensued. DelVal Gamers is a loose association of gamers from the Philadelphia metro area (yes, it includes parts of Jersey!) that meets on evenings and weekends at Showcase Comics in Swarthmore. 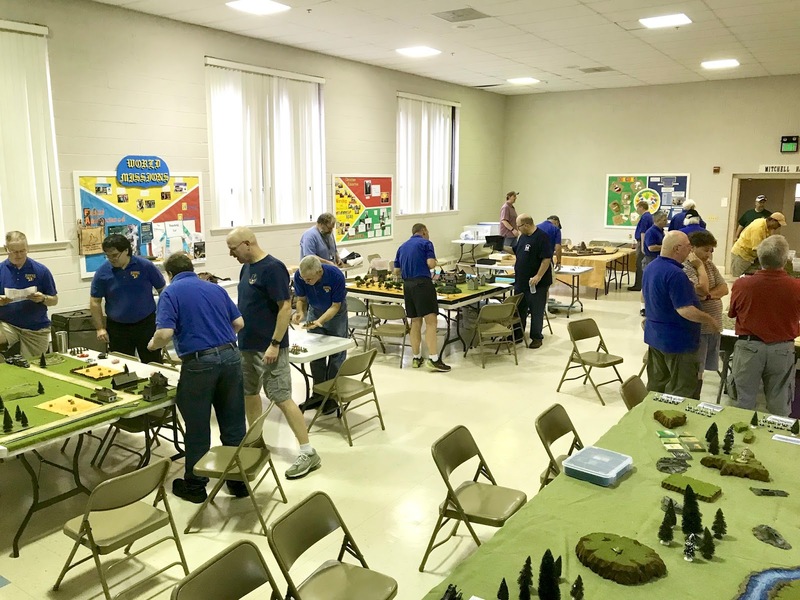 Most months we have a “Day of Games” from 9am to 9pm in a church hall in Springfield, PA (just 75 minutes from Havre de Grace). All the HAWKs are invited to take the short drive to come visit us for a “Day of Games” – just let Cliff Brunken know and he will add you to the DoGs mailing list. 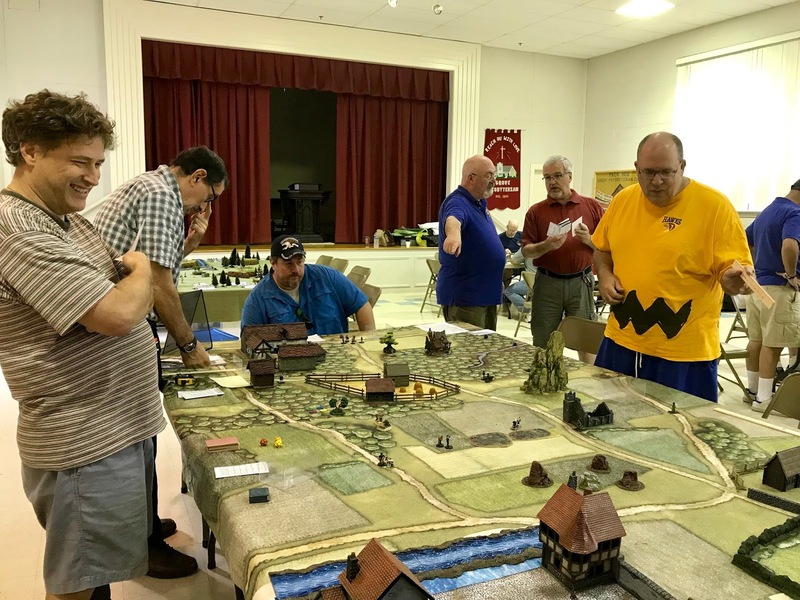 One of our gamemasters, Don Manser, also runs Kozcon – October 21st in South Jersey; a one day gaming convention dedicated to the memory of his friend Dave Kozlow. All proceeds from this event are donated to the American Cancer Society in Dave’s name. Come game for a good cause. Thanks to you all for being gracious hosts. Let’s do this again! Thanks for additional information, John! I will pass everything on to the gang through the club’s mailing list.